UPDATED: Wed., May 10, 2017, 10:45 p.m.
House Bill 1501, which allows for prosecution of people who fail a background check because they can’t legally buy a gun, passed the Senate unanimously, and the House 83-13. Among Spokane-area representatives, Republicans Mary Dye and Joe Schmick and Democrats Timm Ormsby and Marcus Riccelli voted yes; Republicans Jeff Holy, Joel Kretz, Jacquelin Maycumber, Bob McCaslin, Matt Shea and Mike Volz voted no. 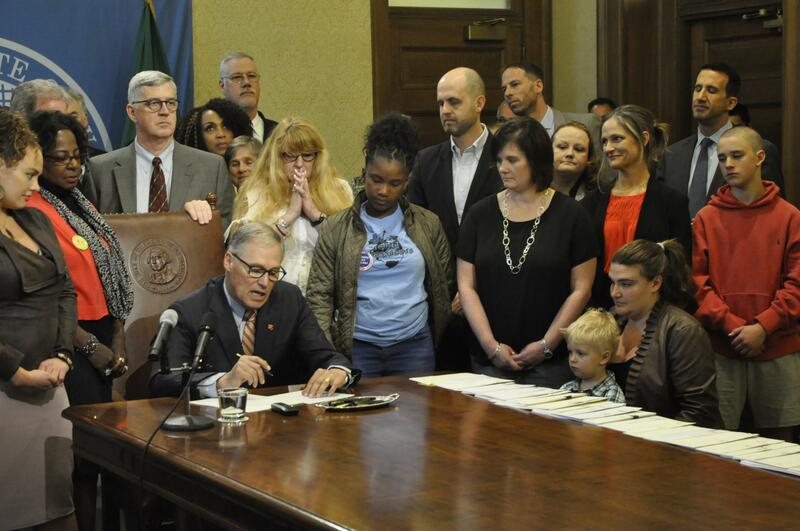 OLYMPIA – Felons and other people who have lost the right to own a firearm will be reported to law enforcement if they try to buy a gun in Washington. A bill signed Wednesday requires gun dealers to report anyone who fails a background check to local law enforcement, who can then seek prosecutions. Victims of domestic violence can ask to be notified if their abuser fails a check. The law, which goes into effect this summer, closes a loophole in state gun laws, Gov. Jay Inslee and supporters said. Background checks determine if a would-be purchaser has a criminal record, court orders or mental health conditions that would preclude them from owning a firearm. Rep. Drew Hansen, D-Bainbridge Island, the bill’s sponsor, said he had asked about the consequences of failing a background check. The answer was none. About 3,000 people in Washington fail background checks each year, Hansen said, with about half thought to be purchase attempts by criminals or fugitives. The new law requires a licensed dealer to report any background check failure to local law enforcement within five days. The person who fails the check can be referred to local prosecutors for charges, although the percentage of referrals that will actually result in prosecutions isn’t known, he said. Under the law, any domestic violence victim can elect to be notified if their abuser tries to buy a gun. Paula Harwood, of Puyallup, said she was “scared to death” when a reporter writing about the state’s background check law told her her abusive former boyfriend had tried to buy a gun. She hadn’t been notified even though she had a protection order against him. Work on the bill represented coordination among the National Rifle Association, the Alliance for Gun Responsibility, law enforcement organizations and victim’s rights groups. It passed in the closing days of the Legislature’s regular session. The days leading up to the bill’s signing have been emotional and brought back memories of years of abuse. On Tuesday she cried, but by Wednesday after the signing ceremony the tears had given way to elation. “I’m on cloud nine,” she said. Published: May 10, 2017, 11:24 a.m. Updated: May 10, 2017, 10:45 p.m.